The trial was originally setup in summer 2014 as a way of testing the cable operator’s new narrow-trenching approach to civil engineering with the John Henry Group (here and here), which reduced the width of the trench used to lay fibre optic cables from 40cm to just 10cm. Normally Virgin Media wouldn’t target such a small community but in this case their infrastructure already passed through the area and that made it viable. On top of that the area also became the first on their network to test a 1Gbps capable Fibre-to-the-Home (FTTH/P) service, which was used to connect around 100 homes and many of those reported speeds of up to 800-900Mbps (Megabits per second). All of this occurred just ahead of the operator’s official Project Lightning launch in February 2015 (here). Since then the network has continued to run and until very recently the locals had still been enjoying the pleasingly fast connectivity. Sadly all that changed a few weeks ago. Without any warning the FTTH connection suddenly went down and this time it didn’t come back up again. Residents had previously been warned to expect occasional downtime as part of the trial but nothing like this. “A few villagers posted on Facebook that it was off and was it just them or everyone and we came to the conclusion it was down for all users on the trial. Then a couple of local VM engineers replied but nothing from Virgin Media in any official capacity to the villagers on the trial, no formal communication about why it had gone off and if it would be back on. We did some checking with another person who is known to be on the trial and they similarly confirmed that the service had stopped functioning. Luckily customers on the trial were also supplied with a traditional Hub 3.0 router, which meant that they could just go back to the old service (i.e. there was no charge for the 1Gbps service on top of their standard package). Nevertheless those affected are now mourning the loss of speed. 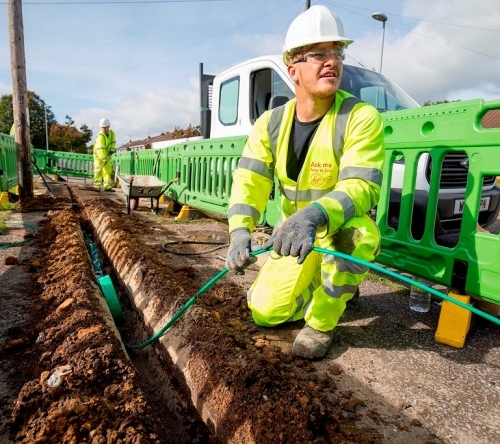 The development is somewhat unexpected, particularly given VM’s stated intention to extend their fledgling FTTH/P based infrastructure out to 2 million premises under the £3bn Project Lightning network expansion by around 2019 or 2020. This will deliver a total of 4 million extra premises passed, albeit with the other half being traditional hybrid coax + fibre DOCSIS. Sadly Virgin Media did not answer our question about the alleged equipment failure in their exchange, although the operator has said that they’re now in the process of contacting customers on the trial to update them and arrange to collect any unused kit. Still being left with the option of a top connection speed that can reach 350Mbps is hardly terrible. So how they are planning to provide internet access in the future on their FTTH/P network? Will they provide service until first equipment failure, and then cancel all agreements because of repairing costs? The residents of West Bergholt, population 3300, will be hoping their new Virgin Media FTTP network survives longer than this trial! Although the economics of carrying out repairs will be different when customers are paying for service and I expect the same equipment will eventually get more users added if/when project lightning reaches the uncabled parts of nearby North Colchester. There were no agreements here, this was a trial not a product. All of those on the EPON trial in Papworth also had ‘standard’ cable modems connected to the network via RFoG. It seems the same regular faction are having a job comprehending it. If you want your speed back buy a few 350Mbps lines and you’ll have 700-1000Mbps again (load balanced via a Pfsense box). Wouldn’t the upload rate be a fraction of that speed though? That will be balanced per destination not per packet which will gives you nothing without proper configuration on VM side. If the network segment can handle 3 x 350Mbps running simultaneously. Ah, this makes more sense if the ‘standard’ service is also provided over the fibre using RFoG. Customers now get the same live service as other project lightning FTTP areas. The article states that the ‘standard’ service was a traditional HFC (coax) connection. The way it was described to me was that they had both coax and FTTP but will check again. Oh your free speed stopped after 4 years, didums! Hrm. Nah the folks on the EPON trial had RFoG supplying the ‘real’ service and EPON on the side as a trial. I think it may have been over two separate fibres though, of course, they could also use the same one with the PON passthrough on the ONT. Being the same physical fibre infrastructure means there’s no chance of this network being sold to anybody else for them to continue to provide service. However, falling back to a 300+ Mbps RFoG network isn’t a terrible position to be in really. If that was an Openreach fibre the people on the trial could just go with an alternative provider, obviously once OR fixed the faulty kit which I guess they’d be obliged to do under the Ofcom cosh. Openreach wouldn’t have been able to extend the trial indefinitely. They’d have had to either put it in production or close it off if it involved third parties. However not all Openreach trials do. The very earliest trials of technology involving the public may not involve CPs at all. The earliest public G.fast stuff for instance did not. It seems a waste if VM are going to abandon all the fibre they’ve installed. They haven’t. It’s used in production carrying RFoG. This seems to be what happened to Sky’s trial of FTTP (FTTH) in Woodville, months of having roads dug up in 2015/16, ran a trial for 6 months, switched it all off. And this is the waste that I and others are concerned about with the rush of alternative FTTP infrastructure providers. Not all of them are going to be profitable so you either have consolidation (like cable TV) or abandoned assets. Hasn’t been a huge amount of evidence of lots of premises being passed by FTTP then abandoned. These homes in Papworth haven’t been abandoned. Bournemouth’s FTTP network was acquired and is still running. If we see the TalkTalk / CFH network in York get dumped, rather than ending up as part of the CFH network, then I’ll be pretty alarmed. Most of these schemes are just at and immediately after the stage of getting financing. The gold rush stage where all is good and rosy in the garden. Very little in the ground aimed at the consumer market at this time. So far, schemes that fold are being picked up (Avebury Vale Council is an example) and the market is in its infancy but once you get schemes building on top of each other, then the issues will start. Investors want returns and aren’t interested in national coverage for its own sake. @of – as an example Gigaclear, funded by BDUK, are overbuilding Truespeed in places in Somerset. Six month free trial stops after four years. Waaaaahhhhhhh! I’d be thoroughly gutted to lose that upload speed. Why didn’t they take it out of trial and start charging for it. Clearly it was working well if people are now missing it.